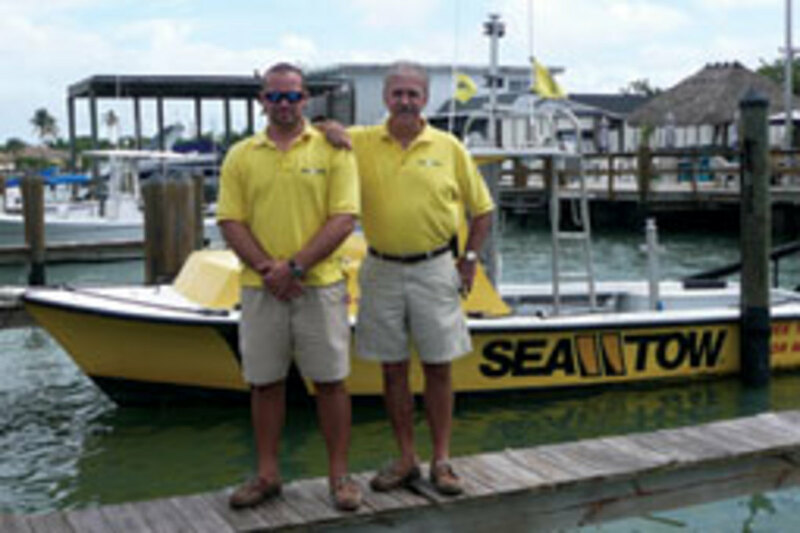 A Sea Tow captain and his brother rescued a family of 21 children, parents and grandparents from a 22-foot deckboat that was taking on water in the Gulf of Mexico off Naples, Fla.
“It was mayhem,” says Dan Mercier Jr., 25, a Sea Tow captain and son of Dan Mercier Sr., owner of the Naples Sea Tow franchise. 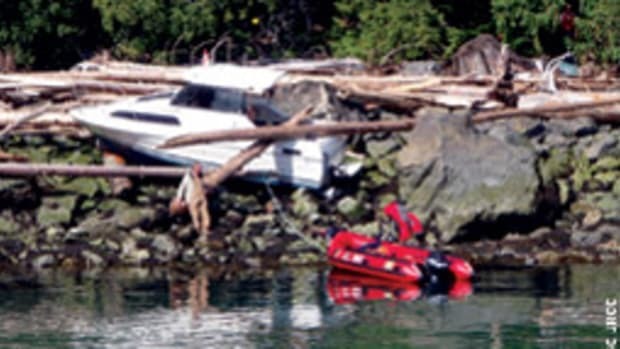 The six children — he estimates they were 3 to 11 years old — were wearing life jackets, but many of the adults were not. Mercier and his brother Chris, 24, who came along as his mate and understudy, threw them life jackets, including their own. “We started picking kids out of the water,” Mercier says, then the elderly. Counting 17 people in his 26-foot Gold Line, Mercier realized it was getting overloaded and ferried them to the Marco Island Princess, a 90-foot dinner-cruise vessel standing by 300 yards away in deeper water. Coming back for the last four people, Chris — a firefighter in training — jumped into the water to help one of the grandfathers, who had a cast on his leg and couldn’t get a life jacket on. Mercier says it didn’t look as if the man was going to survive, but Chris kept him afloat, and with the help of a good Samaritan they lifted him aboard the Sea Tow boat. Mercier says he and Chris were returning to the dock about 7 p.m. on Oct. 2 — a Sunday — when they heard a call over VHF channel 16, “Help! 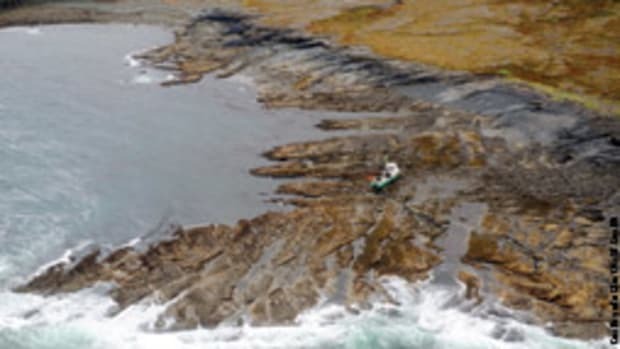 We’re sinking off Keewaydin Island!” Mercier says he was just three minutes from the sinking boat, and that might have made the difference in being able to bring everyone home safely. 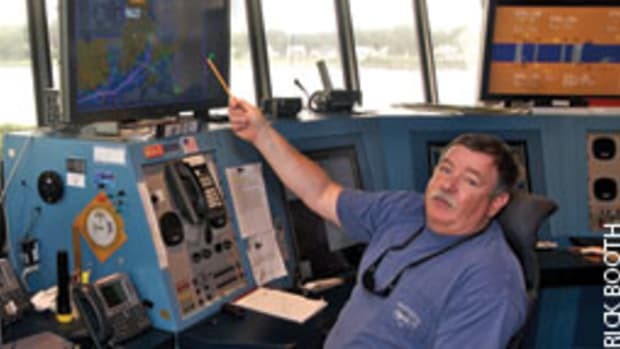 Mercier Sr., who was manning the radio at the Sea Tow base, says it appeared that the deckboat had been cruising in the Intracoastal Waterway and wandered around the south end of the island into the Gulf, where it got into trouble. 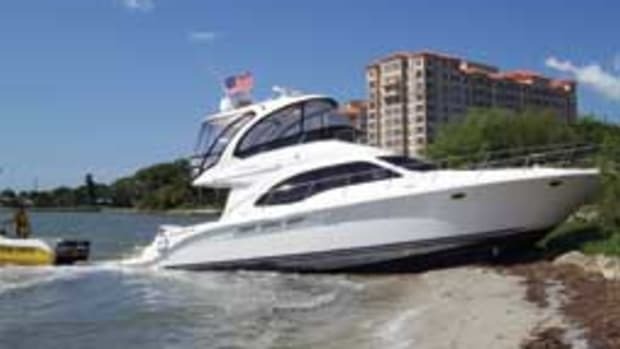 He says the owner only recently bought the boat and was taking his extended family out. “It was way overloaded,” Mercier Sr. says. A boat crew from Station Chatham was honored Sept. 15 by the Coast Guard Foundation during its inaugural First District Awards Dinner at the John Joseph Moakley U.S. Courthouse in Boston. The four-man crew was recognized for the July 31, 2010, predawn rescue of 11 people from a burning yacht several miles off Cape Cod. Boatswain Mate 1st Class Matthew Hussey, Boatswain Mate 1st Class Josh Perkins, MK2 Jason Martin and Boatswain Mate 3rd Class Sherman Baldwin removed the people from the 44-foot Bronze Monkey just moments before flames consumed it. Their life jackets and signaling devices were in the burning cabin. A boat crew from Coast Guard Station Marathon, Fla., rescued four boaters without life jackets on the morning of Oct. 9 near Marathon. They clung to a cooler and treaded water for 20 hours before they were rescued. 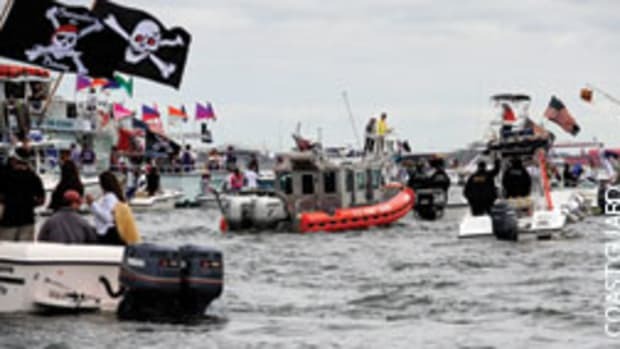 The boaters, including a 4-year-old girl, were from a group of eight whose boat sank shortly after noon the previous day. One of them, an 80-year-old woman, reportedly drowned and did not resurface. 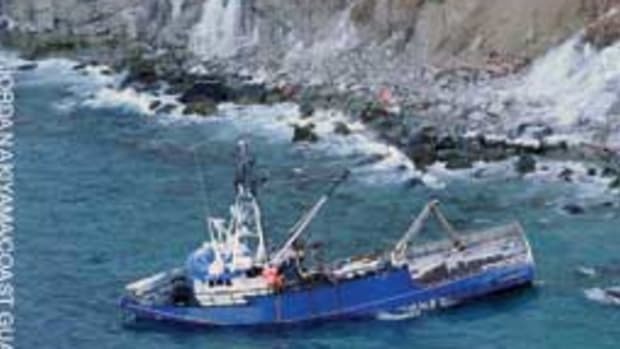 A commercial fishing vessel picked up the three others. The Florida Fish and Wildlife Conservation Commission aided the rescue and was investigating the incident. Three people were safe and one died Sept. 30 after their 24-foot boat capsized about 5 miles east of Cape Porpoise. About 3:10 p.m., watchstanders at Coast Guard Sector Northern New England received a mayday call via channel 16 from the skipper of Job Site 2. The boat was flooding and the crew couldn’t keep up using a hand pump. Watchstanders alerted mariners in the area and dispatched boats, including the 210-foot cutter Dependable. The four boaters donned life jackets and told the watchstanders they were entering the water, after which contact was lost. 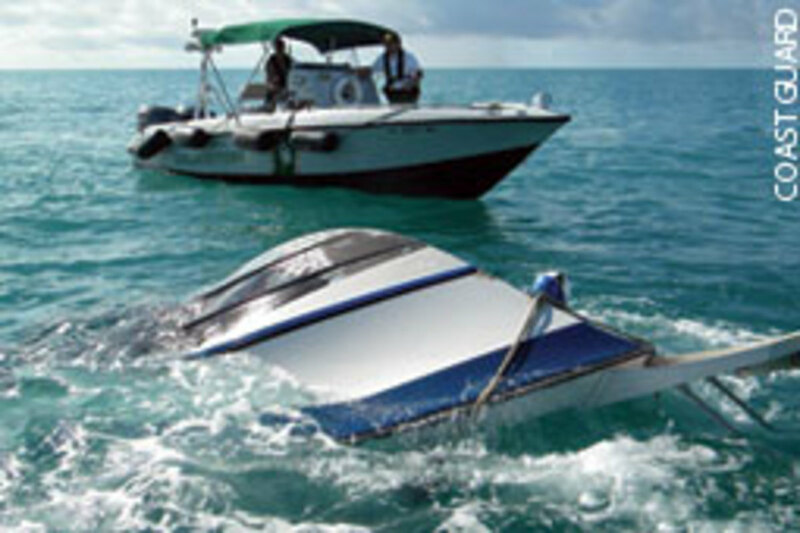 The 48-foot yacht Lady Erica recovered three of the men from the 63-degree water. Two were mildly hypothermic and responsive, but the other was unresponsive and died. 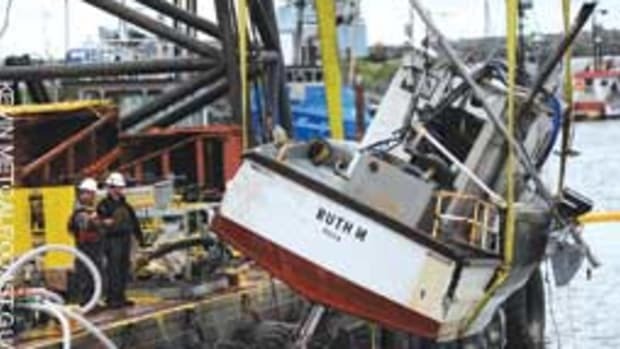 A fishing boat rescued the master from the overturned Job Site 2. He was transferred to the Dependable’s small boat, which took him to Kennebunkport, Maine. The Coast Guard rescued a couple at 10 a.m. Sept. 26 aboard a drifting 22-foot boat 24 miles west of New Port Richey, Fla. Search-and-rescue controllers at Sector St. Petersburg were notified at 7 p.m. the previous evening by a concerned friend who said a neighbor — a 64-year-old man — and his 63-year-old girlfriend were overdue. They had departed for Double Hammock Creek at 10 a.m. Sept. 25 and were expected to return that afternoon. The Coast Guard launched a boat crew from Station Sand Key and an MH-60 Jayhawk helicopter crew from Air Station Clearwater at 11 p.m. The rescuers searched through the night, assisted by the Coast Guard Auxiliary, Pasco County Fire Department and Florida Fish and Wildlife Commission. The Jayhawk located the boat, and a rescue swimmer was lowered to confirm their identity and deliver a radio. The boat had a dead battery, so the pair was unable to call for assistance. The boat crew took the fishing boat in tow. A crew from Coast Guard Station Brant Point rescued a man at about midnight Sept. 16 after he ran aground on the jetty at the entrance to Nantucket Channel. 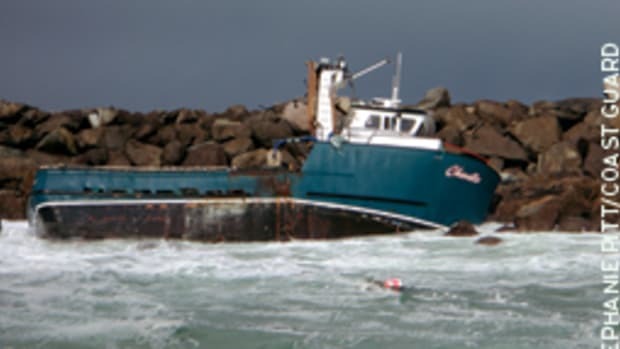 Watchstanders received a call via channel 16 at about 10 p.m., reporting that the 40-foot boat was aground and that the skipper was unable to free it. A Station Brant Point 47-foot Motor Lifeboat launched to assist, but the crew was unable to get close enough to the boat to help the man. An Air Station Cape Cod MH-60 Jayhawk helicopter was launched to assist. About midnight, the boat began to take on water and capsized. The MLB crew was able to throw a line to the man and safely pull him aboard. He was unhurt and was taken to Station Brant Point.